JWE’s first “tweetchat” sparks huge, world-circling engagement! 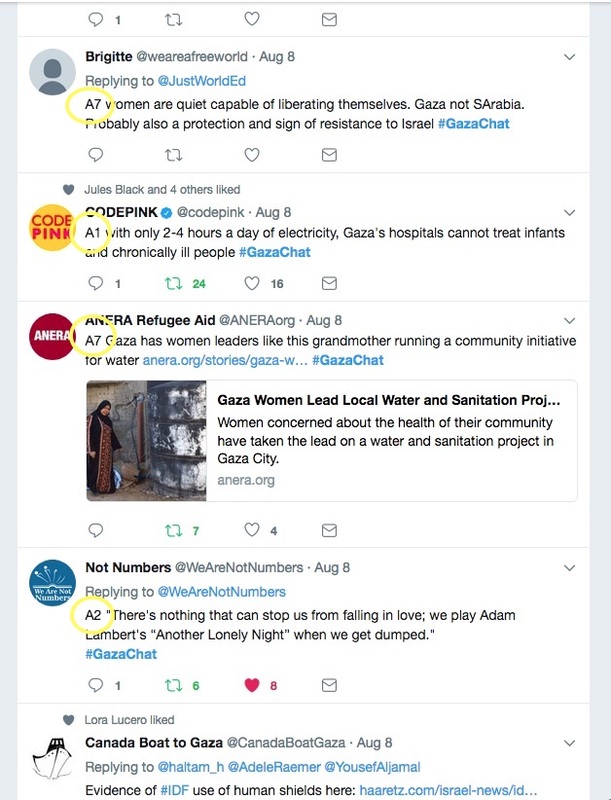 On August 8, Just World Educational held its first, globe-girdling “tweetchat”, under the title #GazaChat, as part of its ongoing #Gaza51Days project. 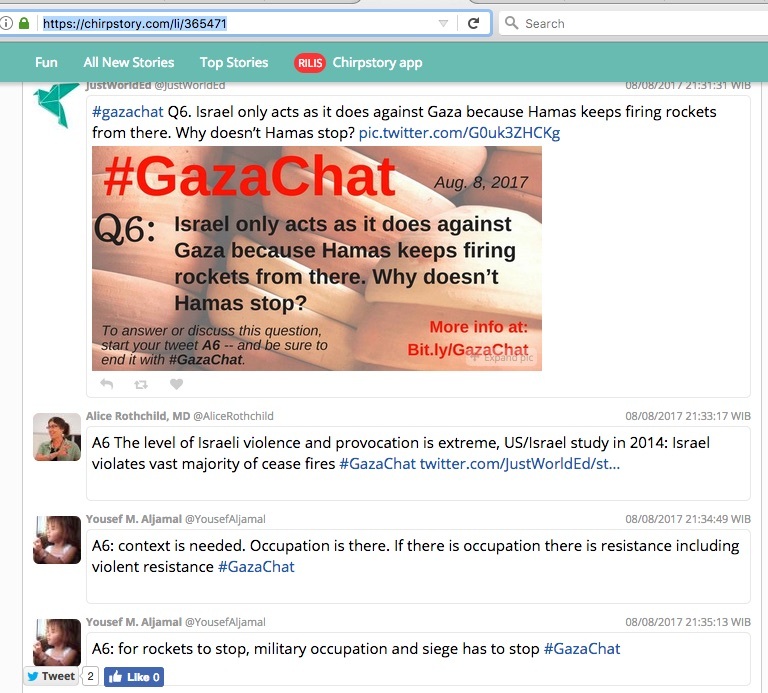 This pioneering effort to use a tweetchat to build networks and engagement among Palestinian-rights activists was a resounding success: In the course of our 90-minute #GazaChat, 247 Twitter users contributed a total of 703 tweets to the semi-structured #GazaChat discussion we had organized. Our metrics also showed that 917,000 Twitter users saw at least one tweet with that hashtag during that 90 minutes! A tweetchat is a specific kind of an online chat, hosted on the popular platform Twitter, that enables people of similar interests to discuss issues in (almost) real time from all around the world. Yousef Al-Jamal, a seasoned social-media specialist from Gaza who is currently studying in Turkey. Twitter can often be a confusing place to visit, and it is hard to have anything like sustained “discussions” there. So in preparation for Tuesday’s chat, a team that included Yousef, Alice, and JWE staff prepared a list of 15 numbered questions, to help provide a framework for the discussion. Many of these questions, like the one at the head of this blog post, were deliberately chosen to provoke the richest possible kind of discussion– which they certainly succeeded in doing! Before the chat, JWE staff prepared the 15 questions on slides, for greater visibility; and during the chat, the slides were tweeted out sequentially every few minutes, in order to give some structure to the discussion. Chat participants were asked to tweet their answers to the questions, tagging each answer with the “Answer Number” related to the number of the question asked. 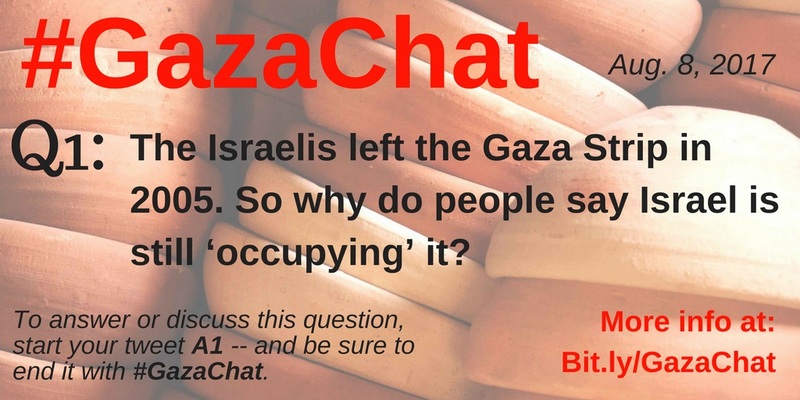 Everyone who wanted to be in the chat was asked also to tag their contributions with the #GazaChat hashtag… and the genius of Twitter is that whenever a hashtag gets added, Twitter puts it into one unified tweetstream just for that tag. So our chat participants (or onlookers) could easily keep their #GazaChat tweetstream updated in nearly real time, for the whole of the 90 minutes. Actually, we had originally planned the chat to last 60 minutes– but the discussion was still so rich as the hour ended that we extended it by another 30 minutes, and most chat participants seemed to stick with us! 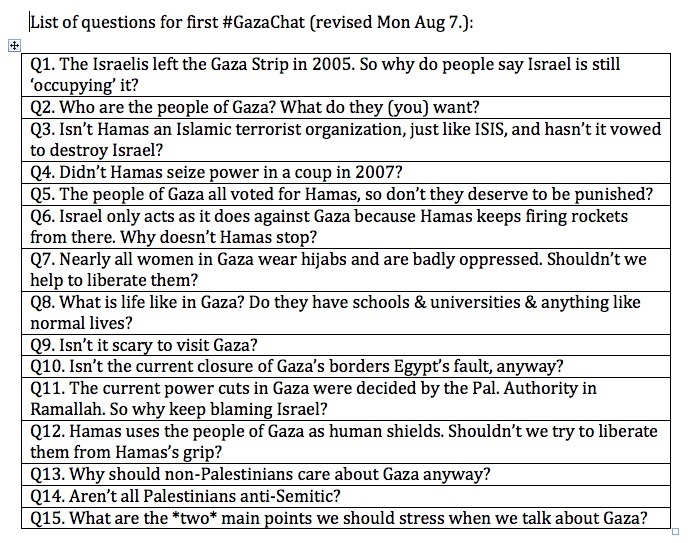 You can see an edited version of the discussions that ensued around Questions 5-8 in our chat, here. Plus, due to inevitable time-lags, the tweetstream for any active hashtag– which ours certainly was!– anyway looks pretty chaotic. So, especially for first-time or infrequent Twitter users (“tweeps”), the net effect can be pretty mind-spinning. But at least, with our use of numbered questions and answers, the content of any single part of the discussion can be fairly well reconstructed later. Another downside to Twitter is that users are unable to keep their hashtags “private” or to block other tweeps from using them. 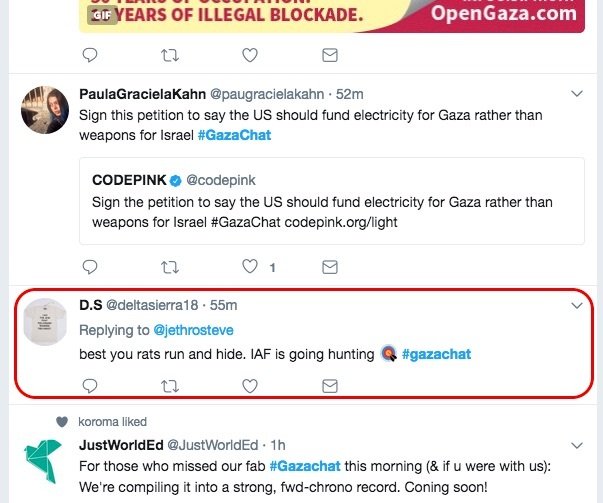 So our #GazaChat hashtag did attract a few purveyors of outright anti-Palestinian hate-speech (see the example here) and some other Zionist trolls… as well as several somewhat skeptical people who seemed to come to the chat space honestly seeking to engage with us there– along with, of course, a lot of truly amazing activists from around the world. We were totally delighted that despite these drawbacks to Twitter, 247 people answered our invitation to participate in our #GazaChat, contributing to a conversation that was rich, insightful, and very thought-provoking! We are still trying to find the best way to preserve the richness of the discussion we all had in the August 8 chat, and to figure out how best to use some of the lessons we learned from the chat in our real-world activism for peace and justice. We warmly invite everyone who’s on Twitter to join this next chat! And if any of you (especially anyone who participated in the first chat) wants to contribute “Questions” or other suggestions to our planning team for this chat, please put them into the Comments section here. We will probably plan to have fewer questions in the next chat, to allow more time for the discussion of each one… but we certainly welcome everyone’s input! Also, if you want to refresh your understanding of how to participate in a tweetchat like this one, you can go to this earlier post on the JWE blog– which we have updated yet again in our attempt to make it as helpful as possible for tweetchat newbies. We hope to see you there and to have another great #GazaChat discussion on August 22!